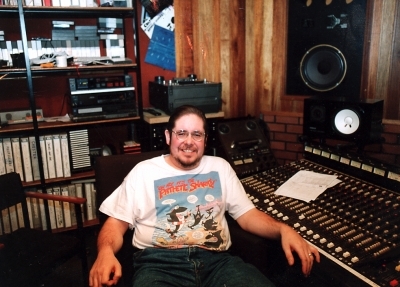 This is me, Mojo, at Moonraker Studios in Longsight, in the early 90's, would have to check the actual date. We were recording tracks for the Right Band, Wrong Planet cassette "The Zog Tapes", I was the guitarist and wanted to be the producer, but it was a collaborative effort with Garry, the bass player and the studio engineer. Sort of self-financed by the band, it was limited to either two or three days, with the minimum of overdubs, except for the sax player, who turned up a day late! It was the usual RBWP madness, I can remember playing behind the isolating acoustic screens with John the bagpipe player, and Colin, the drummer, and busking the intro first track. Much whisky drinking and hard work ensued. We sold the tapes at gigs and I think they all went, as did any money, but the memories are great. I think they were a bit shocked at Moonraker that anyone would play live instruments and vocals, they were more used to EDM and synths, played in the control room, it seemed to take ages to find enough mikes! The Viz T-shirt dates it!